After a couple of tough 70 mile days, on some of the most difficult terrain so far, we decided to give our bodies a rest and take a day off. 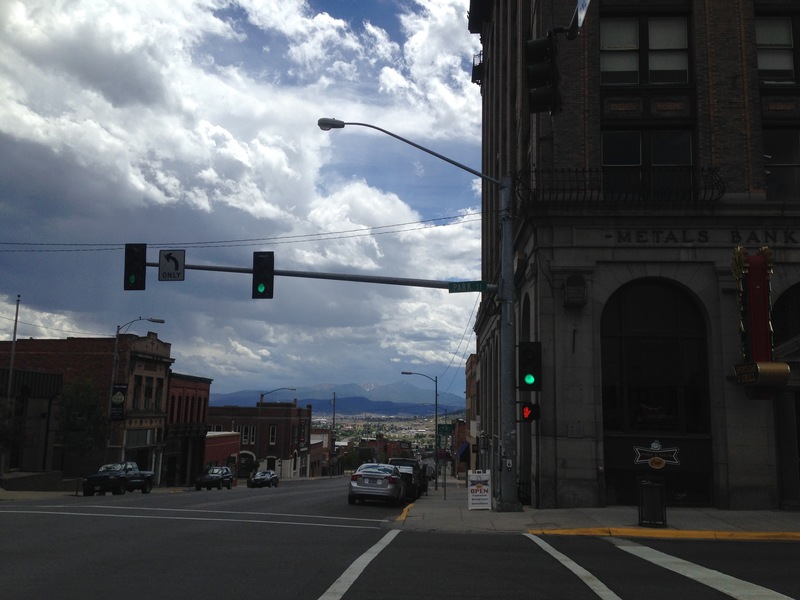 Our 35th day on the Great Divide Mountain Bike route, we spent it eating and resting in a Motel room in Butte, Montana. Leaving Butte on the 4th July, we took a paved road alternate to get some easy miles in, which actually turned out to be quite pleasant after we came off the main highway. 30 miles in we passed some interesting abandoned mines before arriving in Basin where we found a small Cafe for breakfast no.2. After stocking up on eggs, pancakes, pie and ice cream we pushed on a further 40 miles to get to Helena. 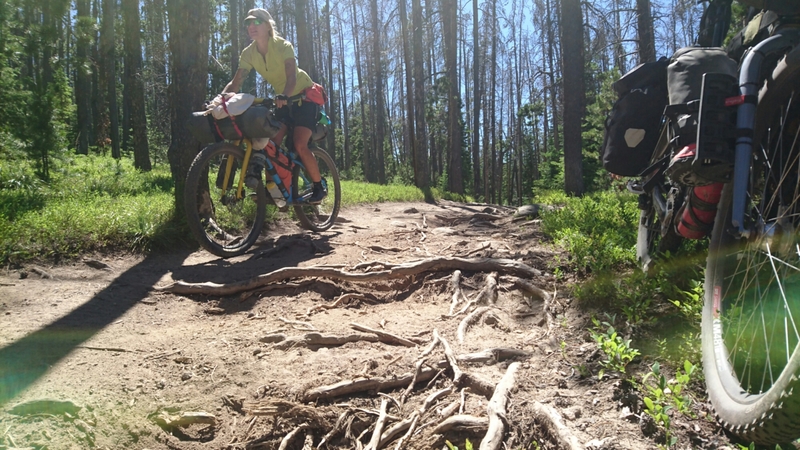 The trail turned from the usual dirt roads into almost singletrack, filled with big ruts, boulders and roots. We had met a couple of other riders at the cafe and passed each other several times over this section, it was fun riding and chatting as we pushed over ‘Grizzly Gulch’! After another Motel in Helena we decided we had been spending a bit too much money and had better take it easy for a while, so we planned a shorter day but to stop at a house offering free camping or possibly a cabin about 40 miles north. This turned out to be an excellent decision, as Barbara and John had created something quite special that they offer to passing riders. 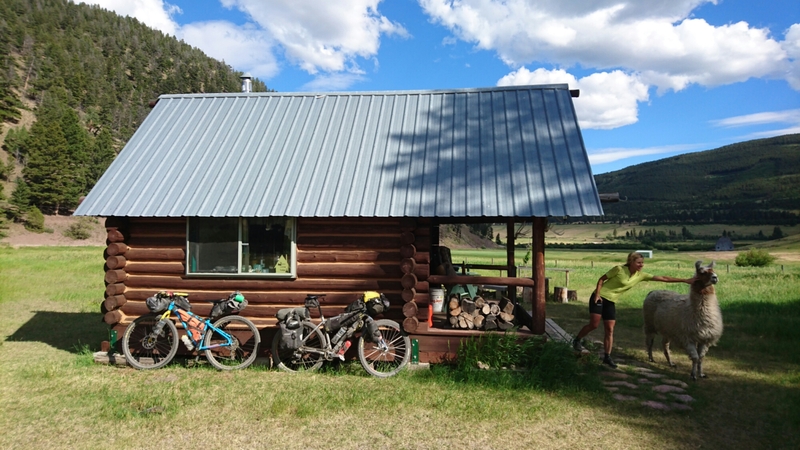 They had been letting riders stay for the past few years and the cabin, which we were lucky enough to get a bed in, was simply amazing. Stocked with food and a stove, set in a beautiful valley, to top it off there were Llamas in the field, which came over to say hello. A couple of riders, Brian and Alex, that we had met a few times over the previous days also showed up, and we had a great evening chatting away. 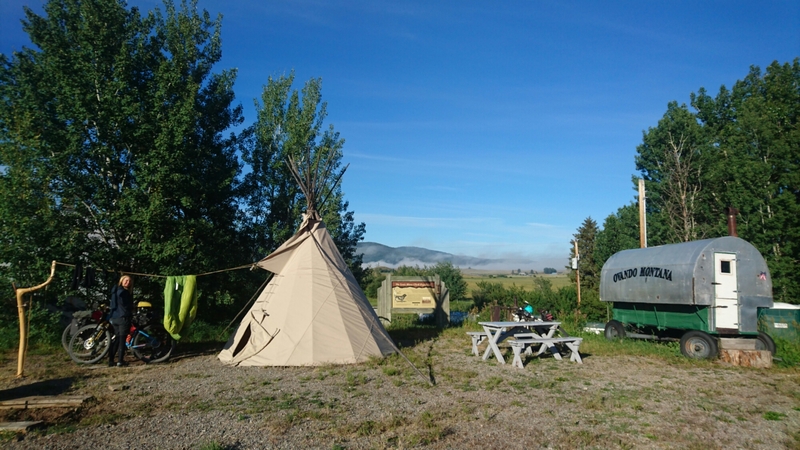 The following day we rode 50 miles to Ovando, the riding was unremarkable, but on reaching the town we had the choice of a tepee or an old wagon to sleep in, for a donation of $5! Being reasonably tall I couldn’t fit in the wagon, so we went for the tepee, which was very comfortable, though for the first time it got a bit cold during the night. 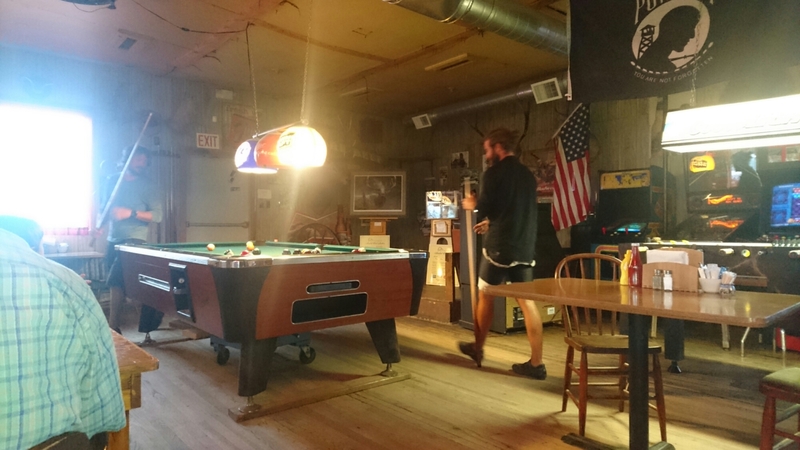 Before we settled down for the night we went to the local bar, where we found Brian and Alex playing pool in their lycra! After an excellent breakfast at the Stray Bullet Cafe, we set off knowing a tough day lay ahead. It started off gently, and we planned to stop for lunch at Seeley Lake, but when we realised it was actually off the route by a mile or two we decided to press on. 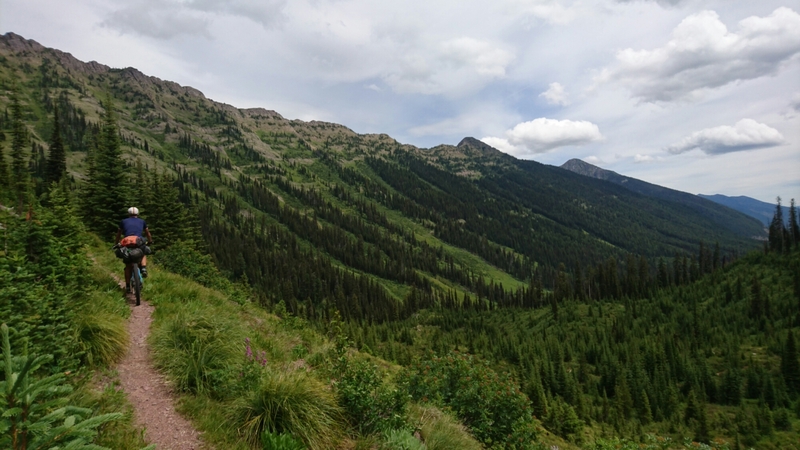 The trail started to climb and soon we found ourselves on beautiful singletrack, the only downside was the increased risk of disturbing a Grizzly Bear. A local mountain biker was killed by a bear a few weeks ago, and though this was an unlucky surprise encounter we tried to be as noisy as possible to avoid a similar situation. We made it over Richmond Peak unscathed, and after some great descending through forests and meadows we reached Holland Lake. We were pretty hungry by this point, 60 miles in, so headed straight to the restaurant, but were disappointed to find it closed for a private event. There was nothing else close by but we had food to cook so not to worry, the next task was to find somewhere to camp. After finding the 3 adjacent campgrounds full, we were starting to get frustrated, when a passing driver stopped and offered for us to stay on his ranch! We followed him for a couple of miles, thinking how we had got lucky again, but once we got to the ranch we were told that one of the other guests ‘wasn’t comfortable with it’ and though there were acres of land where we could have quietly set up camp, we were not welcome! After experiencing such generosity over the last few weeks this was a bit of a shock, but we were still hungry and with time getting on we had to keep going and find something else. 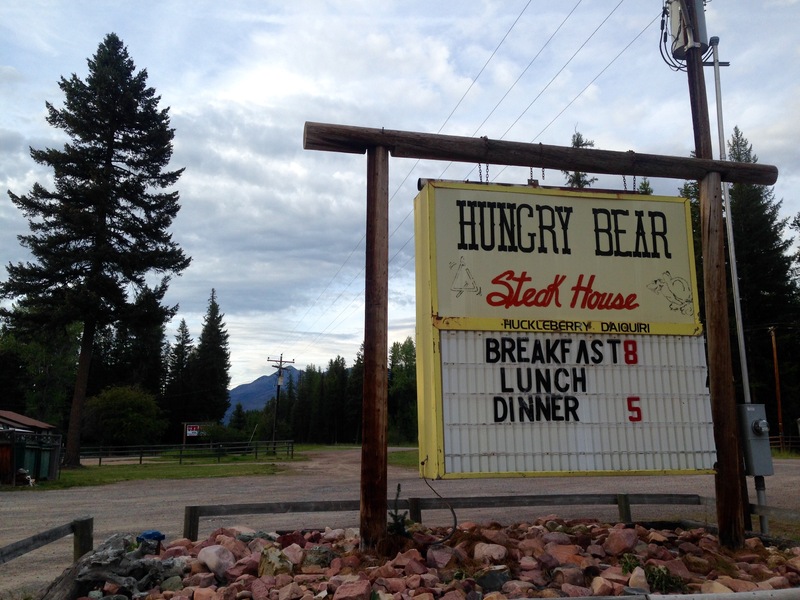 A few miles later we came across an unexpected restaurant that was not on our map – ‘The Hungry Bear’ – so after pizza, burgers, and a call to another campground to secure a spot, our enthusiasm was restored. We ended the day 72 miles in at Swan Valley Centre, which for $10 was just what we needed after a scenic, but tough day on the bikes. The next day, still conscious of how much we were spending, we decided to try another ‘cyclist only’ free camping listed in our maps. 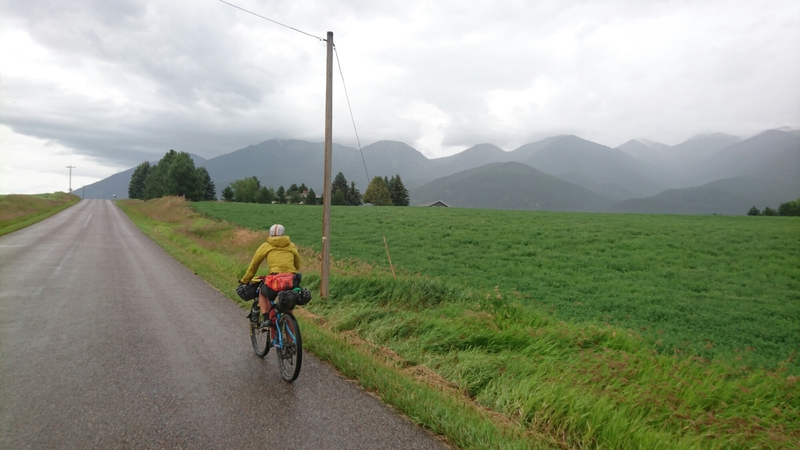 The days ride was fairly flat terrain, but unfortunately for the first time it was quite wet, with rain on and off for several hours. Still, we made the 60 miles fairly comfortably to reach Tom and Pat, who offered free camping at their lovely house just south of Colombia Falls. 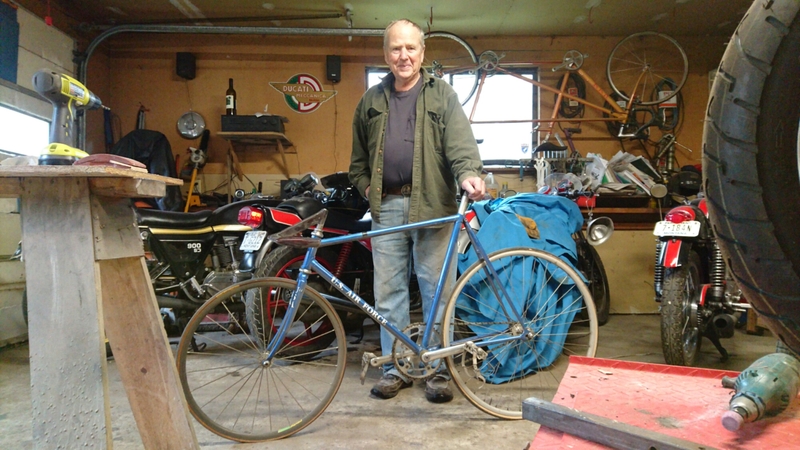 Tom, now in his 80s had given up riding, but had some amazing stories of competing with his son on frames he handbuilt. He showed me some of his old bikes, many of which were quite unique, including a lo-pro track machine, tandem, various aero frames and carbon fibre parts all fabricated by himself. 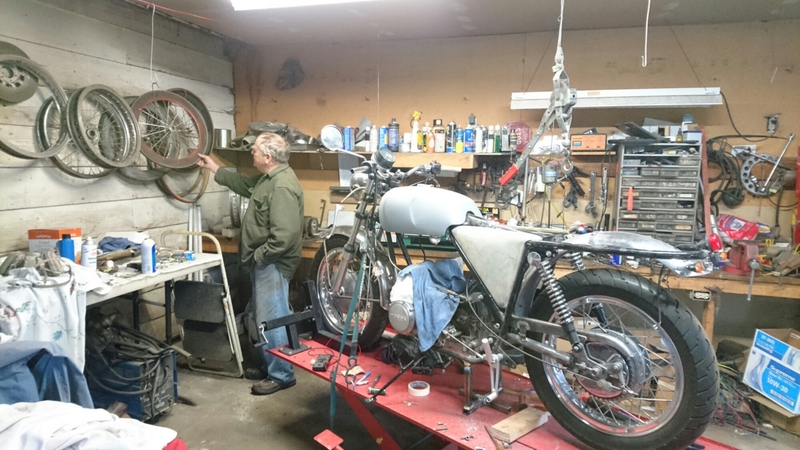 He also had a nice collection of old motorbikes in various stages of restoration, including a Norton that was his current project. 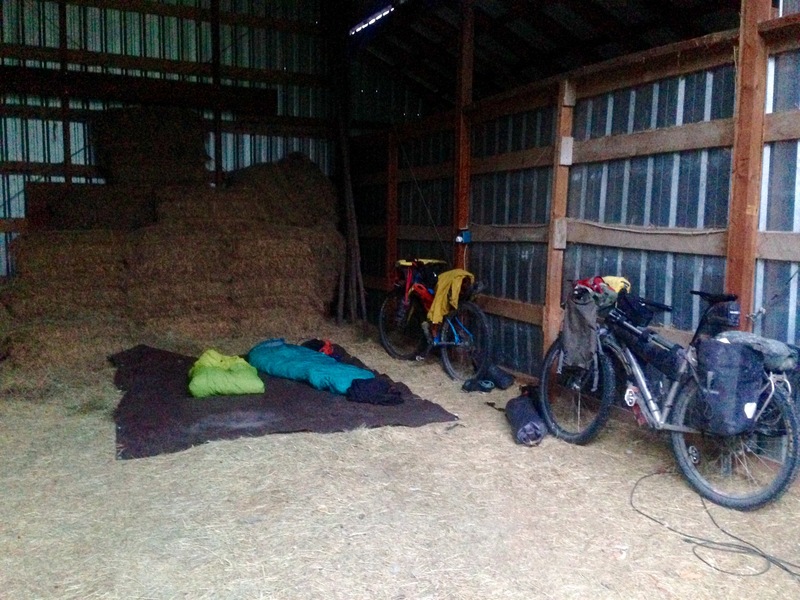 We ended up sleeping on the floor of the barn, in case it rained, which with a high roof and open end felt exposed, but the hay on the floor made for a comfortable night. 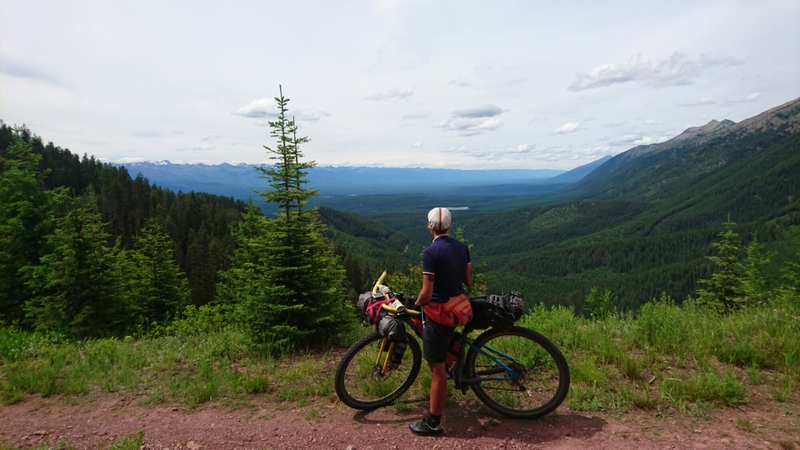 Today, we’ve just cycled 20 miles into Whitefish, and are now taking half a day off to write this and recharge a bit before a push to the Canadian border over the next couple of days. It feels like we’re nearly there now with around 350 miles to go before Banff! You two must be having the most incredible time. Best of luck for the days ahead but something tells me you won’t need any luck. Enjoy it!